Dry skin often is the result of harsh soaps, sun exposure, changes in weather, psoriasis or a thyroid condition, notes MayoClinic.com. People who suffer from dry skin often are uncomfortable or embarrassed by this condition. However, if you know what foods to eat, you can change your diet to help alleviate dry skin, and these foods are a healthy part of a well-rounded diet. 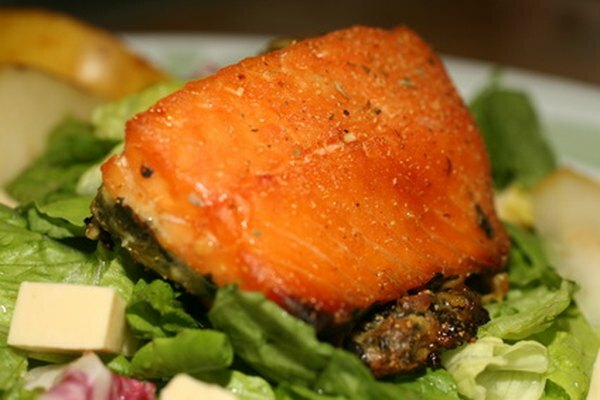 Foods rich in omega-3 fatty acids can help retain your body's essential moisture and reduce inflammation while maintaining the fluidity of skin cell membranes, explains "The Clear Skin Diet," by Alan C. Logan and Valori Treloar. Dry, itchy skin and brittle hair and nails are typical symptoms of a diet too low in omega-3 fatty acids. Common foods rich in omega-3 fatty acids include flaxseeds, walnuts, salmon, sardines, soybeans, halibut, shrimp, tofu, scallops and red snapper. If you prefer, you can take such supplements as fish oil and cod liver oil instead. Topical treatments for such dry skin conditions as eczema, psoriasis and dandruff often include sulfur. If you have dry skin, take advantage of the benefits of sulfur-rich foods, which "The Clear Skin Diet" says can help keep your skin smooth. While sulfur deficiency is difficult to diagnose, this condition often is associated with skin rashes and skin irritations that don't heal quickly. Sulfur-rich foods include garlic, onions, red meat, eggs, carob, broccoli, asparagus, Swiss chard, parsley, sweet potatoes, bananas, tomatoes, coconut and watermelon. Sulfur also is available in supplement form. Foods that contain zinc can help prevent free radical damage to cells. This can keep your skin from drying out while looking healthier and younger, notes chiropractor and acupuncturist Ben Kim's website. Zinc deficiency commonly is associated with skin rashes and wounds healing slowly or poorly. Common foods rich in zinc include beef liver, lima beans, green peas, raw almonds, raw cashews, raw ginger root, chickpeas, cooked split peas and organic beef. While you can buy zinc supplements, DrBenKim.com doesn't recommend them. Too much zinc can result in zinc toxicity, which may cause nausea, upset stomach and vomiting.